Many patients with vision problems heartily embrace the idea of enjoying vision correction without having to wear eyeglasses or contact lenses. Not all of these patients, however, are good candidates for PRK or Lasik surgery, the two standard surgeries used to alter the way the cornea of the eye refracts light. If that describes you, don't fret -- because here at Calloway Eyecare Center, we offer an advanced corneal reshaping technique known as orthokeratology, or Ortho-K. This non-surgical technique can produce changes to the way your cornea refracts light. To understand the benefits of Ortho-K, let us first consider how the cornea works. The cornea is a transparent, spherical bulge that sits over the lens of your eye. In addition to protecting the inner parts of the eye, the cornea also performs some lens-like tasks of its own. The shape of cornea causes incoming light rays to be refracted, or bent, in such a way that the lens can focus them into a clear, sharp image before they pass on to the retina and optic nerve. Ultimately, the optic nerve transmits the image to your brain. Deformations in the shape of the cornea cause refraction to go wrong in various ways, producing the fuzzy images characteristic of nearsightedness, farsightedness, and astigmatism. Glasses and contact lens are curved to "pre-refract" incoming light to compensate for your personal degree of corneal deformation. Laser surgery actually corrects the shape of cornea itself, eliminating most of all of the visual errors that might otherwise call for corrective lenses. While you might leap at the thought of permanently correcting vision problems, laser surgery isn't always the best eye care option. For instance, if you suffer from thin corneas, untreated cataracts, diabetes, certain autoimmune diseases, or a corneal disease called keratoconus, you should avoid laser eye surgery. Some of our patients simply don't like the idea of any kind of surgery, or they want a reversible procedure. Orthokeratology may be an ideal choice for these individuals. Dr. Fielder will map the shape of your corneas precisely and then fabricate special contact lenses. Unlike standard contacts, you'll wear these lenses at night. The lenses perform a subtle corneal reshaping as you sleep, meaning that you can take them out the next morning and enjoy perfect or near-perfect vision. Ortho-K can help you see clearly for one or two days at a time, or possibly even longer. By wearing them regularly at night, you can maintain your clarity of vision for as long as you decide to continue using them. 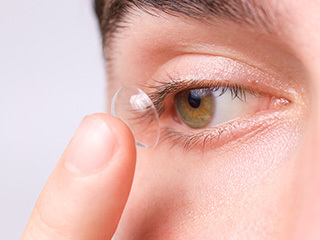 If you decide to use another form of vision correction, simply stop wearing the Ortho-K lenses and your corneas will assume their previous shape once again. Talk to our knowledgeable staff to see whether Ortho-K makes sense for you.